Fabulous article on the 365 Festival at Rover Dramawerks in Texas! 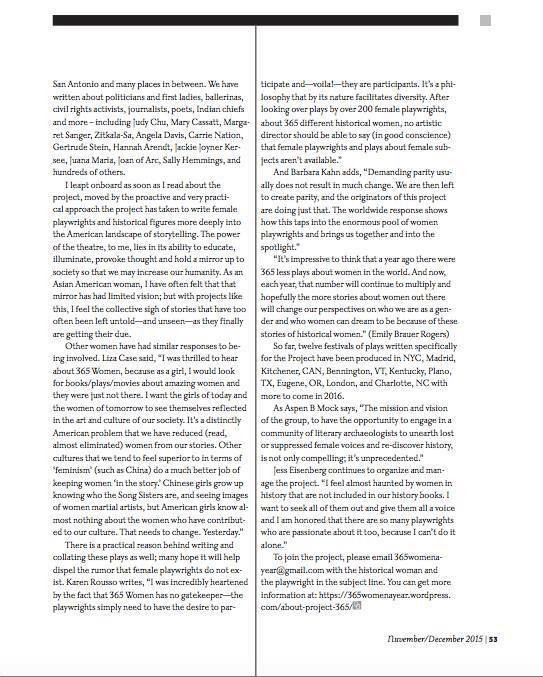 Fantastic article on 365 in New York City Woman! Dallas Observer has a write up about our festival at Rover Dramawerks in Texas! Broadway World shares that Susan Merson produced and directed “In Her Name” to honor Edith O’Hara with 365 plays! Great interview about our upcoming NYC festival and the start of 365 on The Happiest Medium. Broadway World announces the International Women Artists’ Salon! Plano Magazine gives a shout out to our festival at Rover Dramawerks in Texas! Broadway World announces the Rover Dramawerks 365 festival line-up! Broadway World announces 365’s return to NYC 3/23! Bennington Banner write up about Hubbard Hall’s 365 Festival. 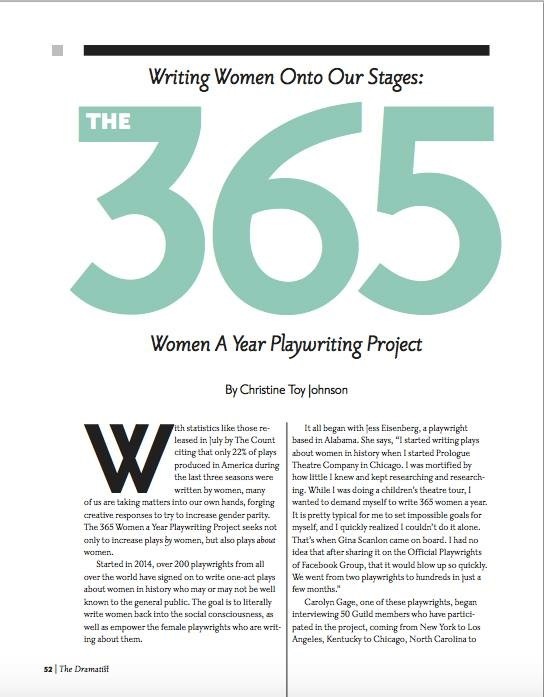 Broadway World L.A. publicizes our 365 reading! Broadway World Dallas publicizes the Rover Dramawerks Festival! The Dallas Morning News picks the Rover Dramawerks Festival for the top 5 theatre events! NoPlays interviews the fabulous Shellen Lubin about participating in 365! D Magazine Front Row promotes the Rover Dramawerks 365 Festival! Off and On: a New York Theatre Podcast: Episode 61 – hosted by Bernardo Cubria (Featuring Gina Scanlon and Karen Rousso) Cofounder of 365 Women a Year, Gina Scanlon and Head of the NYC2 365 charter, Karen Rousso, talk gender, diversity and the media. Oh, and they plug the heck out of 365! NPR for Oregonians 89.7 interviewed director and playwright, Connie Bennett, about the Oregon Swan Day 365 Festival! Jennifer O’Grady’s Charlotte’s Letters, part of 365 and inspired by Charlotte Bronte and Elizabeth Gaskell (also Meta Gaskell, Emily Bronte, and Madame Heger) won first place in the Henley Rose competition. Karen Rousso’s SCRUTABLE is a finalist for the Actors Theatre of Louisville’s Heideman Award. Lolly Ward’s piece inspired by Ethel Payne and Alice Dunnigan, called “Black Press in the White House” will be published in the Smith and Kraus “105 Five-Minute Plays” coming out in March. Jennifer O’Grady’s “FIRST DAY IN TRADE,” about Jackie Onassis and which she wrote for 365, will be published in The Best Ten-Minute Plays 2017, edited by Lawrence Harbison and due out later this year from Smith and Kraus. The play was first produced last year by Rover Dramawerks in its 365 festival. Erin Moughon’s piece inspired by Aphra Behn “Just Say It Three Times” will be published in the Best Short Plays of 2017 edited by Lawrence Harbison. The original production starred fellow 365 playwright Kendra Augustin as Aphra Behn. Jennifer O’Grady’s “The Great Gaffe” will be published in Smith and Kraus’s The Best Ten-Minute Plays 2016! Congrats!